Papercuts Theater is a thrilling ride into the outer realms of possibility, best when played at loud volume, or listened to on headphones for the ultimate immersive experience. 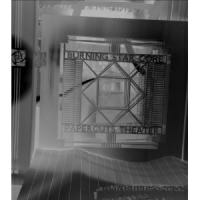 Papercuts Theater is a live album with a twist from Burning Star Core, the experimental drone-based project fronted by avant-violinist and electro-acoustic shredder C. Spencer Yeh. The twist comes via the influence of Grayfolded, the album constructed by plunderphonics pioneer John Oswald from numerous live recordings of the Grateful Dead's "Dark Star". Yeh has mixed together live recordings from over 60 performances to form one "work" divided into four parts, each around 16 minutes long. In doing so, he enacts a kind of death -- or suicide -- of the author, leaving the resulting pieces to assume their own consistency in the mind of the listener. "Part I" seems to begin quite raucously, but once adjusted to the sound world Yeh creates, one finds oneself listening to what could be a single piece by a band playing acid, space, or psychedelic rock--Hawkwind, perhaps, or Acid Mothers Temple. Sure, it's a muffled, noisy recording, but so are plenty of recordings by Hawkwind and AMT. The drums get less regular and more excitable as the four minute mark approaches, then shift into interstellar overdrive for the remainder of the track. "Part II" does away with any warming-up and starts off in immediate overdrive, the drums seemingly in constant solo mode and the "musical" part oscillating between mildly dissonant violin and wildly distorted strings of unidentifiable origin. This mutates into full-on apocalyptic noise and the most painful of the four sections. Partial relief comes in "Part III", which is constructed mainly from chopped and distorted speech fragments. If "Part II" was a crash landing onto another planet, this is the garbled, unintelligible chattering of alien beings as they sift through the wreckage looking for survivors. As the intensity and strangeness increases, you may well hope they don't find you. "Part IV", with the removal of rhythm in favor of resonance, is the closest thing on the album to a pure drone, though there is plenty going on to sully the waters. Toward the culmination of the track, and the album, the violin comes to the fore, a reminder of the human presence behind the machinery. Papercuts Theater is a thrilling ride into the outer realms of possibility, best when played at loud volume, or listened to on headphones for the ultimate immersive experience.